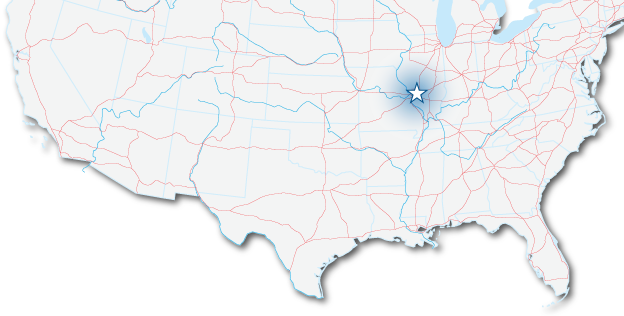 Highland, Illinois has direct access to all major forms of transportation, including immediate access to many of the nation’s key interstates, a class one rail bisects directly through the city, four airports all less than an hour away, and two ports within 60 miles that offer many services for the surrounding industries. With the close proximity to St. Louis and the development of High Speed Rail Service from St. Louis to Chicago and recently proposed to Kansas City, you will have additional resources for moving your supplies and products. The Madison County Transit provides Highland with many transportation opportunities. Numerous public bus routes, a Paratransit service for the disabled and elderly, bikeway development, as well as overseeing RideFinders, the St. Louis regional rideshare program. Working in conjunction with the other St. Louis area organizations, Madison County Transit provides seamless access to regional transportation services. The Madison County Transit regulation route provides an express route to St. Louis. For more information about the Madison County Transit, visit www.mct.org or call 618.931.7433. Amtrak currently offers passenger rail service from St. Louis. With the development of High Speed Rail Service from St. Louis to Chicago and now also proposed to Kansas City, you will have quicker and better passenger service available. Highland has a great network of roads and easy access to the interstate highway system. Highland has developed a master trail plan and all new developments are required to build in trails.